These guitarists go on by explaining that they try to spend time each day practicing scale patterns and chord shapes, they study up on theory, and they learn songs here and there, but overall they just don’t seem to get anywhere. They usually don’t have any illusions of being rock stars, but they still wish they could arrive at a place where they feel satisfied with their guitar playing skill and style. In short, they feel like they’re always chasing something without ever catching it. First off, there are the obvious details of how to practice guitar. These details would include how to finger scale patterns, how to form chord inversions, how to improve your picking accuracy, and so on. I cover these details in my Fretboard Theory video instruction, so I’m not going to get into them here. Instead, I want to address the problem that arises even when guitarists have these things to practice. Even when you have things to practice, you’ll never actually arrive anywhere unless you set a destination. Even though you know what to study, you’ll never have something to show for yourself unless you create some type of finished product. Let me elaborate on my two points from above by explaining the difference between professional and non-professional musicians. Have you ever heard the phrase, “Take this show on the road”? 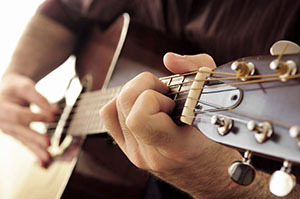 When professional musicians practice guitar and learn songs, it’s for a specific purpose. They aim for a goal and a destination, which is completing a set list and taking it on the road. Non-professional musicians typically don’t work toward this type of goal–they never take it on the road–instead they constantly remain in a state of learning and practicing with no end it sight. This causes the non-professional to feel like they’re not getting anywhere. Another thing that professional musicians do is compose and record music for release. In this situation, the musicians again have something to show for their work. They have a finished product. Non-professionals may play regularly, but they don’t invest that time into creating a finished product, so they never get to experience that feeling of accomplishment. It’s always a “work in progress” with no point of completion. If everything I have said above about non-professional musicians describes how you feel, then the solution is for you to start setting clear goals and working toward specific accomplishments. Learn a set of music to perform at a local venue, seasonal event, neighborhood party, and so on. Make it a goal to book yourself to play somewhere once in a while. Work on recording a cover or original song. Upload it to a website like Soundcloud.com and share it with friends and family. See how many tracks you can finish over a year’s time. Take either option above and film videos. Film yourself performing songs or improvising over a track and upload the videos to YouTube to share with the world. Set a goal to add a new video each month or so. Below are a few examples to illustrate my suggestions above. My friend Terrance wrote and recorded the song below, and I played electric guitar on it for him. It’s not likely to be a hit, but we sure had fun putting it together, and we have something to show for our work. This next guy did a rhythm guitar cover of a song from Andy Gibb and I think he did a great job! He has something to show for himself too! This next guy made a video of himself improvising over a jam track. Again, he did a great job and has something to show for himself. So if you’re stuck in a rut and feel like you’re spinning your wheels, then set a clear goal and work toward accomplishing it. Pick a song you like that’s within reach of your abilities, learn it as best you can, and record yourself playing it. Or compose a solo to play over a track. Or compose a short original piece of music, with or without words. Any one of these goals will give more focus to your practice time and give you something to show for yourself when you’re done. So instead of just practicing for the sake of practicing, work toward creating something to show for yourself. This is what the pros do. They prep for a recording session or a tour. You can prep for your own performances and recordings. 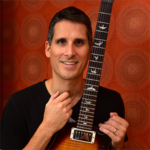 You can also follow this plan as you work through my Fretboard Theory video courses. While learning each musical concept I teach, make it a point to learn a few of the songs I reference, and capture your performances of these songs in some manner. You can also compose something original based on the musical concepts and songs you learn about along the way. These processes will help you retain more of what you learn because you’ll be putting what you learn to actual use. By the time you finish all the Fretboard Theory courses, you’ll not only be a much wiser musician and a much better player, but you’ll have your own body of work to show off too! Also see, How Often and How Long Should I Practice Guitar Each Day?